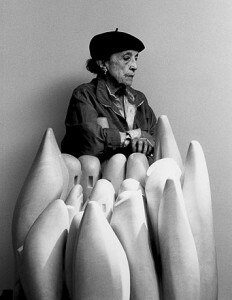 The iconic artist, Louise Bourgeois, is honored by the culmination two major events. 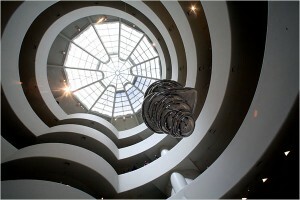 Her exhibit at the Guggenheim in New York recently opened on June 27th. 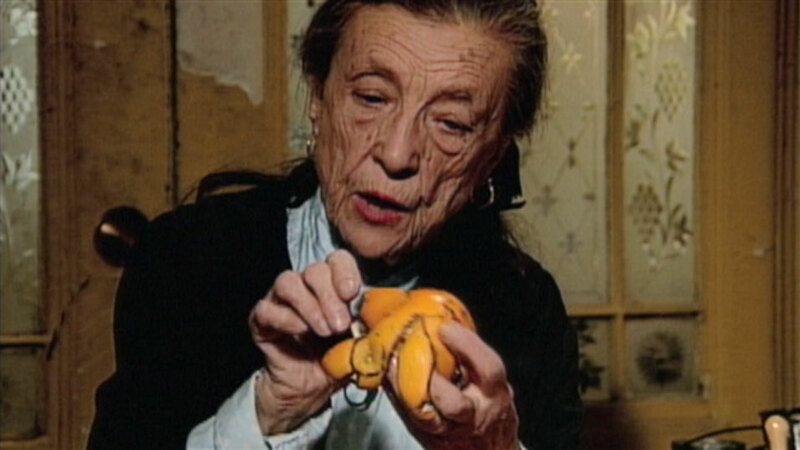 June 25th was the theatrical premier of “Louise Bourgeois:The Spider, the Mistress and the Tangerine”, a documentary about her life and work at the Film Forum. 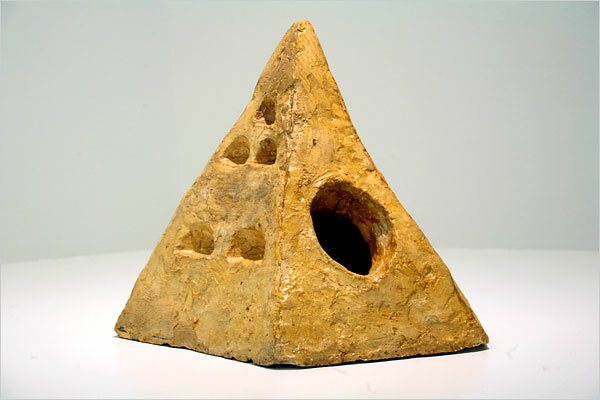 Deeply influenced by her traumatic childhood, Bourgeois has produced copious amounts of work that is not only extremely personal, but also engaging through its raw emotion and symbolic references.She has never stopped at one medium, but instead has worked with paint, fabric, marble, plastics, wood, bronze, and found objects. She has taken part in a plethora of significant art movements throughout her career, and during that time, produced many drawings, paintings, sculptures, installations, and performance pieces. 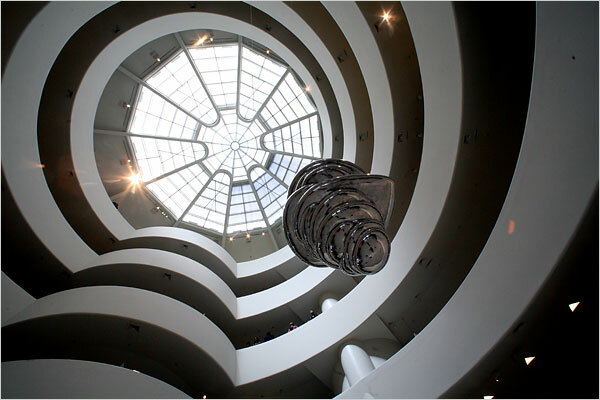 The Guggenheim exhibit, simply titled “Louise Bourgeois”, spans throughout the entire Frank Lloyd Wright rotunda. Within the Rotunda hangs Untitled (2004) piece that suspends two spiraling, aluminum, cocoon shaped objects above the viewer’s head. 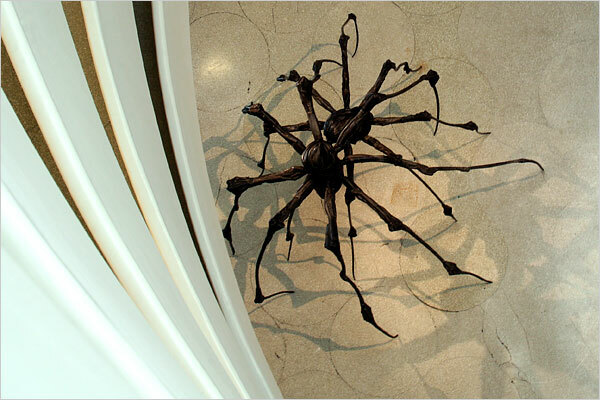 The exhibit, which goes through September 28th, also features a pair of her recognizable bronze spiders, in addition to many other equally powerful pieces. 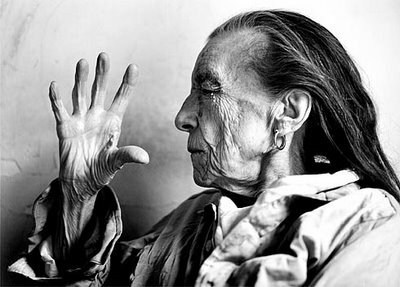 The documentary film, “Louise Bourgeois:The Spider, the Mistress and the Tangerine”, is a portrait of the artist and her intriguing life works. Bourgeois has been acknowledged as one of the most influential artists of our time, and this film strives to show the persona behind her art. The film was produced and directed by Amei Wallach and Marion Cajori. In 1982, Louise Bourgeois became the first woman to be celebrated by a retrospective at the MoMA, and now at the age of 96, is clearly one of the most significant artists, gender notwithstanding, alive today. Chino: 13170 Central Ave., 909 628-0071. Fontana: 16707 Marygold Ave., 909 822-3246; 6396 N. Citrus Ave., 909-823-3888; and 8565 Nuevo Ave., 909 822-4493. 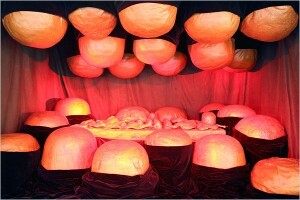 Rancho Cucamonga: 11200 Base Line Road, 909-477-2780. Rialto: 1411 S. Riverside Ave., 909-877-9706. Monday:Sloppy Joe, tator tots, mixed vegetables, cole slaw, melon mix Tuesday:Pork tenderloin with gravy, mashed potatoes, club spinach, orange gelatin, whole wheat bread, banana Wednesday:Roast turkey with gravy, mashed potatoes, vegetables, spinach salad, dinner roll, white cake Thursday:Meatloaf with tomato sauce, baked potato, broccoli, salad, whole wheat bread, peaches Friday:Baked chicken, potatoes au gratin, cabbage, apple and celery salad, whole wheat bread, apricots Intervale Senior Services provides hot, nutritious lunches for seniors 60 and older at 11:15 a.m. Monday through Friday at the San Dimas Senior Citizen and Community Center, 201 E. Bonita Ave., San Dimas. Cost is a suggested donation of $2 and includes low-fat milk. Information: 909-394-6298. Monday:Italian sausage with green peppers, broccoli cheese soup, spaghetti, peas and carrots, Waldorf salad, whole grain bread, orange sections Tuesday:Salmon with dill sauce or roast beef with gravy, split pea soup, rice pilaf, Normandy vegetables, Greek salad, whole grain bread, peach cobbler Wednesday:Lasagna, chicken noodle soup, baked squash, marinated tomato and onion salad, French bread, chocolate pudding Thursday:Chinese chicken salad, vegetable soup, Chinese crispy noodles, salad, whole grain roll, pineapple chunks, sliced honeydew Friday:Barbecue pulled pork sandwich, potato and onion soup, mustard potato salad, corn relish salad, coleslaw, apple pie Lunch is offered weekdays to seniors 60 and older in Claremont at 11:30 a.m. at the Joslyn Senior Center,660 N. Mountain Ave., and at noon at Blaisdell Park, 440 S. College Ave.
Monday:Turkey patty, potato soup, mixed vegetables, salad, tangerine or tangelo Tuesday:Barbecue beef on whole wheat roll, coleslaw, potato salad, peach crisp Wednesday:El Pollo Loco style chicken, flour tortilla, broccoli salad, black beans, bread pudding, wild berry juice Thursday:Mahi Mahi with Asian vinaigrette, brown rice, gingered carrots, salad, almond cookie, orange juice Friday:Beef parmesan, lentil soup, whole grain bread, scalloped potatoes, beet and onion salad, honey dew or strawberries The City of Montclair Senior Nutrition Program offers lunches Monday through Friday for seniors 60 and older, paid for in part by the San Bernardino County Department of Aging. Hours are 11:30 a.m. to 1 p.m. at 5111 Benito St., Montclair. Suggested donation is $1.75. Information: 909-625-9462. 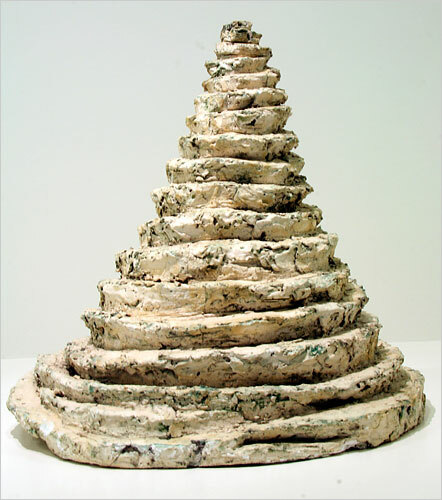 This entry was posted on Monday, June 30th, 2008 at 1:05 pm	and is filed under Art News. You can follow any responses to this entry through the RSS 2.0 feed. You can leave a response, or trackback from your own site. Read Anna Rosencranz’s piece on Louise Bourgeois on http://www.nyartbeat.com for more on this amazing show.